In a time of freelancing and start-ups, co-working spaces are growing. 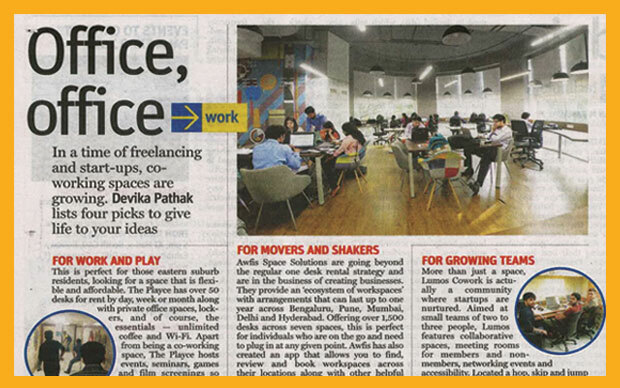 Devika Pathak lists picks to give life to your ideas. Awfis Space Solutions are going beyond the regular one desk rental strategy and are in the business of creating businesses. They provide an ‘ecosystem of workspaces’ with arrangements that can last up to one year across Bengaluru, Pune, Mumbai, Delhi and Hyderabad. Offering over 1,500 desks across seven spaces, this is perfect for individuals who are on the go and need to plug in at any given point. Awfis has also created an app that allows you to find, review and book workspaces across their locations along with other helpful information. At: Ground Floor, Poddar Chambers, Mathuradas Mill Compound, Lower Parel.